Pakin, Pohnpei—Symtech Solar, a renewable company has recently completed phase two of a solar power project on Pakin Atoll in Pohnpei, according to its newsletter. “Symtech Solar partnered with Peace Corps and Mahi International to install Phase 1 of a group of solar PV systems on the island’s local school to help bring the area out of fossil-fuel dependency,” the newsletter said. Phase 2 added another 4kW Off-Grid photo-voltaic (PV) system including a 24 meter telecom tower that will serve to provide a communications link between Pohnpei and Pakin. The newsletter said that the Phase II project includes 16 roof mounted solar panels and then went into technical details we are not technically equipped to understand. It says that the system will provide more than 18 kilowatt hours per day in usable energy from the roof mounted array while also storing 11 kilowatt hours of “usable energy” in the battery bank. “This system eliminates the need to rely on power generation from diesel fuel generators and the transportation costs of liquid fuels from the main island,” the online newsletter said. “Pakin Atoll’s economy is primarily based on its fishing industry, but with stark limitations to electricity access, business development proves to be very difficult,” the newsletter says. “Essential revenue for the people of Pakin Atoll is derived from preserving marketable fish and transporting them to Pohnpei for sales. However, even such basic tasks, such as ice preservation, are inhibited without electricity. “Clean, reliable energy supply supports businesses in the region, which drastically stimulates the local economy, in addition to offering ultimate electricity independence and consistency. 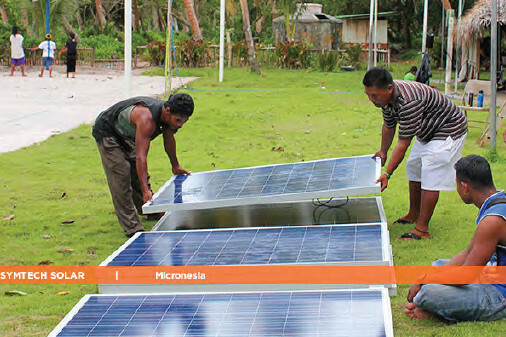 Such ripple effects in Pakin Atoll demonstrate the significance of solar installation and serve as a hopeful symbol for energy development in the future,” the newsletter concludes.